Flashpackers and families seeking a non-pretentious beach resort with all sorts of activities will fit in well at Milky Bay. Set towards the western side of Ao Baan Tai on the way to Thong Sala, Milky Bay greets you with towering bamboo forming a tunnel over the gravel lane to reception. 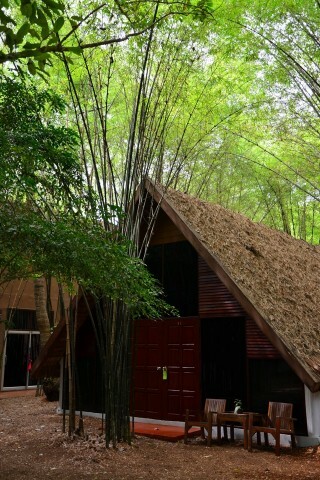 Bamboo appears throughout the shaded grounds, which feel relaxing and spacious despite the many different room types and facilities. The cheapest wood bungalows are painted white and, while small, are a lot comfier than your average hut thanks to air-con, soft mattresses on raised platforms, safes, fridges, coffee/tea facilities, lanterns and clean hot-water wet bathrooms. We checked out room A1, with two plastic chairs on the wood porch and windows opening to a view of the surf. Other standard bungalows are placed further back and go for the same price. Milky Bay offers five pricier room types, including superiors with floor-to-ceiling glass fronts in a single-floor attached building, and huge A-frame log villas with sofas and extra beds for families. The top of the line is a two-storey, 56-square-metre beach house with both indoor and outdoor living space set over the sand. Natural accents and touches of Thai art add to the understated feel of the resort. Milky Bay’s staff was among the most helpful and polite that we came across on Pha Ngan’s south coast; a Burmese man did a terrific job of explaining all of the resort’s offerings while showing us around. Start with a game of table tennis or volleyball before moving on to the steam room, spa and swimming pool, and top it off with a cocktail while watching the sunset from the beachfront restaurant. All rates include breakfast. Check rates at Milky Bay Resort on Booking.com.